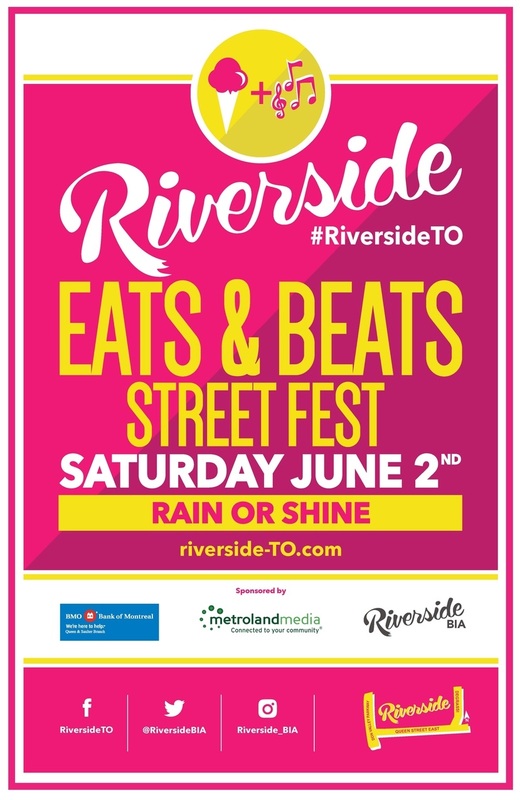 See your TOMORROW at Riverside Eats & Beats Streetfest! Tomorrow, the Riverside BIA team and our many volunteers – from local employees and residents to the fabulous students of George Brown School of ESL – will be starting festival set up bright and early at 6am! We’ll be setting up barricades and signs for festival street closures first, then tents, tables and festival decor. As part of the Riverside Walks 2018 series and the official Doors Open Toronto Walking Tours programme, the Riverside BIA debuted a new Riverside Walk with four walks on May 26th and 27th: in the theme of Film & TV! Over 200 visitors and residents attended the four walks hosted by Riverside BIA as part of Doors Open Toronto, with a focus on Film & TV. Walk-goers enjoyed exploring the neighbourhood and all the local stories, photos and tidbits that has made this a film & TV hotspot for decades. Stories shared included: the famous De Grassi Street which inspired the Degrassi TV series, Riverside’s transformation for “Cinderella Man” (2005), filming at iconic Toronto’s landmarks including The Opera House and The Broadview Hotel, and so much more. After the walks, participants went on to enjoy food, drink and shopping in Riverside – all supporting local businesses! The 2018 Riverside Magazine is now out in local businesses and community centres, and is being distributed door-to-door to residents – and folks are loving this fresh issue! Your can also find it ONLINE! The Riverside Magazine is an exciting annual publication that highlights life in this happening Toronto ‘hood. this year’s edition puts a focus on food (‘Beer + Food…the Perfect Marriage), entertainment (‘Put on Your Dancing Shoes’), history (‘Then and Now’, and local products and services (‘Switchback Cyclery, Not Your Aveerage Cycle Shop’) that make up the bustling 10 blocks of the Riverside BIA. With eye-catching photo spreads, in-depth local business stories, and a handy directory, the Riverside Magazine is a must-read for those who live, work and/or visit in and around this ever-changing Toronto neighbourhood. The Riverside Magazine will be replenished weekly in local businesses, or BIA members can contact us to get more copies! You can also always find the magazine online here. Check it out! Soundstreams presents The Little Match Girl Passion and is offering a 20% discount for Riverside’ers! David Lang’s Pulitzer Prize winning fairy tale for voices, based on Hans Christian Andersen’s fable. The program also includes, the world premiere of James Rolfe’s I Think We Are Angels for voices and accordion. Use Promo code ‘Riverside20’ – for a 20% discount – Pls share this opportunity with colleagues, family and friends! Fake bills continue to be an issue in Riverside with ‘customers’ attempting to provide fake $50s and $100s. The photo shows a real versus a fake $50 where you can see clear differences, once you know, with the fake bill: colours are more vibrant than usual, and the holograms are opaque or incorrect. The fake bills are paper and easily able to be ripped whereas the real bills are plastic. People provide fake bills as part of a scam where the ‘customer’ waits for staff to be busy and distracted, and then ‘customer’ may be pushy and impatient – putting the pressure on staff even more – or otherwise they want to buy a low-priced item and get change for the large bill. Training all staff to spot fake bills (usually $50s or $100s) and ‘customer scam’ techniques like this, and saying NO to accepting the bill or making change for the bill, are good ways to help prevent this crime. Contract: 17TEY- 102TU, Start Date: June 4, 2018, End Date: June 22, 2018. A Public Meeting is being held by the Planning and Growth Management Committee to consider the request to amend the Official Plan and Zoning By-Law Application No. 16 270071 STE 30 OZ. This is the Unilever Precinct Planning Study Area and the applicant is First Gulf. The proposed Official Plan Amendment would bring forward a Secondary Plan to implement the vision for the Unilever Precinct area that was identified through the comprehensive study, and would also permit the proposed development.